Cobalt glass—known as "smalt" when ground as a pigment—is a deep blue coloured glass prepared by including a cobalt compound, typically cobalt oxide or cobalt carbonate, in a glass melt. Cobalt is a very intense colouring agent and very little is required to show a noticeable amount of color. Cobalt blue glass is also used as an optical filter in flame tests to filter out the yellow flame caused by contamination with sodium, and expand the ability to see violet and blue hues. Moderately ground cobalt glass (potassium cobalt silicate)—called "smalt"—has been historically important as a pigment in glassmaking, painting, pottery, for surface decoration of other types of glass and ceramics, and other media. Cobalt aluminate, also known as "cobalt blue", can be used in a similar way. 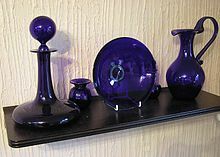 Cobalt glass such as Bristol blue glass is appreciated for its attractive color and is popular with collectors. It is used in the distinctive blue bottles of Harvey's Bristol Cream sherry and Tŷ Nant mineral water. The earliest known example of cobalt aluminate glass dates to a lump from about 2000 BC in ancient Mesopotamia, very possibly intended for use as a pigment; it was rare until the modern era. Cobalt oxide smalt appears as a pigment in Egyptian pottery about five centuries later, and soon after in the Aegean region, and this is the pigment normally known as smalt. In paintings, smalt has a tendency to lose its colour over a long period, and is little used today. However, when used in ceramics for underglaze decoration, it keeps its colour well, and is the main blue used in blue and white pottery from a wide range of dates and areas, including Chinese blue and white porcelain from the Yuan and Ming dynasties, Renaissance Italian maiolica and Delftware. Chinese porcelain used smalt glazes from the Tang dynasty onwards, though Chinese cobalt glass is found from the Zhou dynasty (1122–221 BC). Cobalt was used as a pigment in Central Asia from the 13th century. A fragment of a mud painting in the ancient Tangut city of Khara-Khoto has been found to contain smalt, judged to be dated between the 11th and 13th centuries. A large quantity of smalt was purchased for the decoration of the gallery of Francis I of France at Fontainebleau in 1536. Smalt, normally now discoloured, is common in European paintings from the 15th to 17th centuries. For example, it is found in Hans Holbein the Younger's portrait of Sir William Butts (ca. 1540), in Michael Pacher's painting "The Early Fathers' Altar" (ca. 1483), and in the frescos of Domenico Ghirlandaio (1449–1494). The invention of a European smalt process has traditionally been credited to a Bohemian glassmaker named Christoph Schürer, around 1540–1560. However, its presence in Dieric Bouts' The Entombment from circa 1455 proves that it was used at least a century earlier. The process used for producing cobalt smalt glass at the Blaafarveværket industrial manufacturing center in Norway in the 19th century has been documented as smelting cobalt oxide together with quartz and potassium carbonate. The result was an intensely blue glass-like substance that was ground and sold to producers of glassware and porcelain. ^ a b Encyclopedia Iranica, "Cobalt"
^ Watt, J. C .Y. (1979). "Notes on the Use of Cobalt in Later Chinese Ceramics". Ars Orientalis. Freer Gallery of Art, The Smithsonian Institution and Department of the History of Art, University of Michigan. 11: 63–85. ISSN 0571-1371. JSTOR 4629297. ^ Jules Marie J. Guiffrey; Léon Emmanuel S.J. Laborde (marq. de) (1877). J.M.J. Guiffrey (ed.). Les comptes des bâtiments du roi, 1528–1571. Suivis de documents inéd. sur les châteaux royaux et les beaux-arts au XVIE siècle, recueillis par le marq. L. de Laborde (in French). Paris. p. 96. Retrieved 6 November 2010. ^ See: (1) Mauro Bacci and Marcello Picollo, "Non-Destructive Spectroscopic Detection of Cobalt(II) in Paintings and Glass," Studies in Conservation, vol. 41, no. 3, pages 136–144 (1996); especially page 136; and (2) C. Altavilla and E. Ciliberto, "Decay characteristics of glassy pigments: an XPS investigation of smalt paint layers," Applied Physics A, vol. 79, pages 309–314 (2004); especially page 309. ^ See also: Bruno Mühlethaler and Jean Thissen, "Smalt," pages 113–130 in Ashok Roy, ed., Artists' Pigments: A Handbook of Their History and Characteristics, vol. 2 (Oxford, England: Oxford University Press, 1997). ^ Rutherford John Gettens; George Leslie Stout (1966). Painting materials: a short encyclopaedia. Courier Dover Publications. p. 158. ISBN 978-0-486-21597-6. Retrieved 6 November 2010. ^ Tone Sinding Steinsvik (2000). Koboltgruvene og blaafarveværket: en del af den store verden (in Norwegian). Modums blaafarveværket. ISBN 978-82-90734-20-1. Retrieved 6 November 2010.